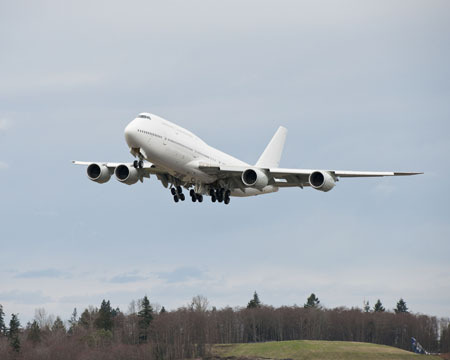 This photo shows the airplane taking off for its delivery flight from Paine Field on Feb. 28. EVERETT, Wash., Feb. 28, 2012 /PRNewswire/ -- Boeing (NYSE: BA) celebrated a major achievement in the effort to create a Queen of the Skies for the 21st Century, delivering the first 747-8 Intercontinental VIP airplane to an undisclosed customer. The airplane, which was delivered with a minimal interior, will enter service in 2014 after its VIP interior is installed. "This is a great day for Boeing," said Jim Albaugh, president and CEO of Boeing Commercial Airplanes. "The 747 is the most iconic airplane in the world, and I know customers are going to love what we've done to enhance its performance. The Intercontinental is fast, efficient and quiet, offering real savings and a great flying experience. And I believe it's one of the most beautiful airplanes in the sky." The VIP version of the 747-8 Intercontinental provides a cabin with 4,786 square feet (444.6 square meters). This 747-8 VIP will include Greenpoint Technologies' Aeroloft, located above the main cabin between the upper deck and tail of the 747-8 VIP, giving the airplane 393 square feet (36.5 square meters) of additional cabin space. The Aeroloft will be installed by Boeing Global Transport & Executive Systems (GTES) in Wichita, Kan.
With Aeroloft, the VIP-configured 747-8 offers a total of 5,179 square feet (481.1 square meters) of cabin space, can carry 100 passengers and has a range of about 8,840 nautical miles (16,372 km). It provides double-digit improvements in fuel burn and emissions over the 747-400, and is 30 percent more quiet. With a normal cruise speed of Mach 0.86, it is the fastest large commercial jet. The 747-8 VIP jet is the only large airplane in its class that fits today's airport infrastructure, giving its owners the flexibility to fly to more destinations. Building on the current 747's capability to fly into most airports worldwide, the 747-8 VIP uses the same pilot type ratings, services and most ground support equipment. To date, undisclosed customers have ordered nine 747-8 VIP airplanes.